Blogging is fun and engaging. You can do it as a hobby, to express yourself, to share your story with the world. Or you can do it to make money. Many people these days go online and search for ways to start a blog and make money from it. This speaks of the fact that making good income from blogging is definitely not dead. There are many bloggers who earn a sizeable income from their blogging activities. Their income streams are varied, but one thing is for sure. With the right approach and strategy, you can start a blog and make money from it. Disclaimer: This post contains some affiliate links. This means that if you purchase anything through my links, then I will get a small commission at no expense to you. Starting a blog and making money from it is something that many people consider. However, most give up before even starting with it. Others start, but quit before they can get any results. Starting a blog and making money from it requires patience, commitment and the ability to take strategic steps. Starting a blog is not the challenge. The challenge is in monetizing it and making money from it. Making money used to be a lot simpler years ago when the internet was not overrun with these many websites and blogs. However, just because it’s harder to monetize now, does not mean it’s impossible. You just need to think creatively, and sometimes even outside of the box. Ok, let’s dive into the necessary steps to create your blog first, then we’ll discuss monetization techniques. You’re probably hear over and over from other bloggers and successful website owner to go the self-hosted route. This is an awesome advice, and there is a reason that so many of us recommend it. When you’re self-hosted, you’re the boss. No one can tell you what to talk about, what guidelines to follow, what you can and cannot have on your own website. Moreover, no one else but you controls your content. You’re in charge of everything you create. Now you might be asking whether isn’t this the case every time you come up with content ideas and actually create it? The simple answer is no. If you’re not self-hosted, then it’s like you trusting a complete stranger with your bank account information- you’re always at risk. Everything might work out well for you, it does for many. However, there is no way to guarantee it. Let’s say you decide to start your blog on Wix, Weebly, WordPress.com or even Facebook. What do these websites all have in common? You don’t own the content there. The platform does not beatlong to you. The platform has their own guidelines. If for any reason any of these websites close down, then you’re out of luck! Your content, views, search results-everything is gone. Related: Read my post on starting a blog from scratch for step-by-step guide. I would suggest not experimenting in this area when starting a blog, and just go with the self-hosted option. This will serve you in the long run too, especially if you want to start a blog to make money. Once you selected your host, your next step would be to sign up/register your own domain name. If you’re reading this post, I am gonna jump to the conclusion that you know having a domain name is important. Something like yoururl.wordpress.com does not sound professional, nor does it speak of authority and trustworthiness. Even though your content is the most important aspect of your blog, appearances still play a role. Not having a professional domain name might turn your readers off. Some might even see your domain and leave without even giving you a chance. For your domain name do your research. You want it to be easy to spell, easy to remember, available, and representing what your blog/website is about. Most hosting companies nowadays offer you the chance to get a domain name through them. Some, including Bluehost (aff. link), even give you a free domain name if you host with them. You might decide to not get your domain name with your hosting company. In this case, get a domain name with a third party like GoDaddy or NameCheap (aff. link). To start a blog or website, you need a theme. This is true whether you want to monetize your site or simply have it for fun. If you go with wordpress.org for your platform, then there are numerous themes that you can go with. There are free and premium themes. The free themes offer less features and customization options than than the premium ones naturally. However, you should not let choosing a theme hold you back and delay launching your blog/website. Remember, you can change your theme at any time. Just select something to start, and you can change it at a later time. The key is to choose something that offers different layouts-meaning you can have full-width screen or one with a sidebar. You also want the option to be able to customize the header so that you can insert your own logo. WP Astra [aff. link](free theme) (premium version is available)-I use Astra premium version with Elementor Pro on my site. StudioPress themes [aff. link](these are premium themes built on Genesis framework). Thrive Themes [aff. link] (premium themes that are part of Thrive Themes). Ocean WP (free theme, although a premium version is available). Remember that white space is your friend. The trick to having your website look professional, even if you DYI’ed it is to resist filling out every white space with text and images and colors. Use colors sparingly, only for accents. Have a uniform look for your site. Choose 2-3 fonts and stick to them. Adopt a graphic method for your posts, social media, and email. In other words, start creating your brand look and feel from the moment you select your theme. When you finish setting up your blog, you want to make sure that your blog is legal. This means that you should have all the required policies in place. There are required policies and also policies that are highly recommended. These website policies is where many bloggers or business owners go wrong. They think of these policies as non-essential. Unfortunately, sometimes it’s too late to fix this mistake because you get in trouble due to not having had proper protections and policies in place. Related: Read my post on how to blog legally and staying compliant. Starting a blog that makes money means you’re starting a business. Would you start a business without proper protections, policies and legal guidelines in place? I doubt it. Then why do so many of you treat the legal protections and policies as non-important? My guess is that some of you don’t know where to go and what to do to be legally compliant and protected. Then there are some who think some online policy generator is good enough. 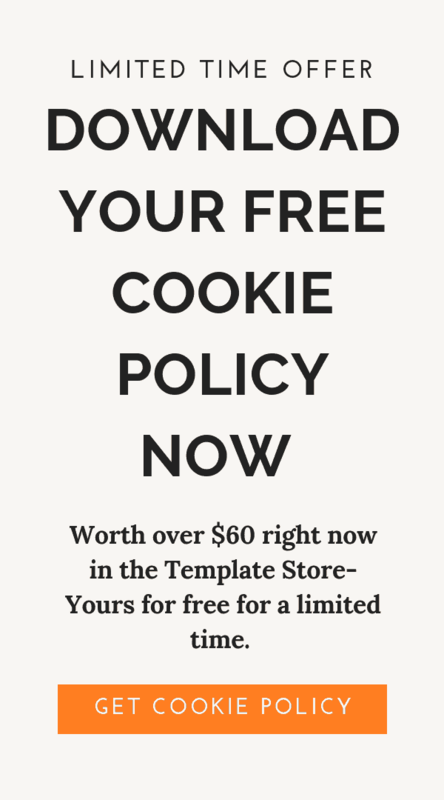 Related: Visit Template Shop to get policies and agreements. News flash…it’s not! Website policies, protections, and other agreements related to your business are complex in nature. There are nuances that you need to have in place that online policy generators just don’t do. Agreements and policies are not a one size fits all deal. However, when you use online policy generators or a free policy that someone gave you, you’re essentially saying that everything in your business is exactly the same as the next person’s. I feel confident to say that this is not the case. Your business or blog is unique and you run it a certain way. You have your own policies or terms that you want your readers to understand. If you have products or services to sell, then you want to have a refund/return statement. This helps you safeguard against people who buy your products, benefit from them, then ask for refunds. To solve this problem and to offer you 100% attorney-prepared and customizable policies and agreements, I’ve created a Template Shop where you can get all your policies and agreements. As a blogger, you’ve heard about picking a niche to be successful. Now this is not a written rule. There are quite a few bloggers out there who’ve continued blogging and monetizing without picking a niche. However, as a general rule, picking a niche gives you better chances of successful monetization. This is because when you pick a niche, you now have a clear direction going forward. You know what products to promote, what services or products to offer for sale. Moreover, having a niche helps you create your content strategy for your blog or website. The content is where many new bloggers struggle with because they don’t have a clear plan and don’t know what to blog about on regular basis. Related: Read my post on why a blog should have a niche and get my free worksheet for figuring out your own niche. Your niche does not have to be stifling or limiting. For example, if you’re niche is motherhood or family, it does not mean that all you can talk about is motherhood literally. There are many other sub-niches that you can tap into and use. Now some people choose a specific sub-niche and stick to it. Others pick an umbrella niche and blog about different topics that fall under sub-niches. If you follow any of the successful bloggers, then you know that they all have niches. Carly of Mommy on Purpose-She is a perfect example of someone who chose an umbrella niche and blogs about different sub-niches. Her main niche is on parenting and family, but she blogs about vacations, finances, and even blogging tips. Louise of Solopreneur Sidekick-Her website is great is full of useful content. Her niche is website design and explaining technology for non-techies. Melyssa Griffin of Melyssa Griffin-Melyssa is an online marketer, entrepreneur and digital course creator. Her website is full of amazingly useful and helpful content that bloggers and other marketers can use. All of these bloggers have different niches and topics. However, they all have a sense of direction as far as where their website is headed and what content to create for their audiences. If you’ve followed me for any length of time or read my blog posts, then you know that email list building is one of my passions. I personally don’t think any business or blog should even attempt to monetize without first concentrating on email list building. There are various methods of building your email list. Related: Read how to quickly build your email list with Facebook Live. It used to be the case that bloggers or website owners would simply put “Join My Newsletter” or “Sign Up to Get Updates.” These methods worked very well 5-10 years ago. Free Download: Get my in-depth Facebook Live Blueprint to help you massively build your email list-FAST! However, as the market became saturated with bloggers and websites, information and content became abundant, people entered into information paralysis. There was so much content available online that very few were willing to give out their email addresses to join a newsletter. Then, bloggers and other websites started offering incentives to join. This incentive is called a lead magnet or a freebie. They can be coupons, discount codes, ebooks, guides, videos, charts, checklists, etc. This is a free resource that is ideally created for your target audience. This is something that your target audience wants. If they want to get it, they have to give you their email address. Now, the European Union came up with and started enforcing the General Data Protection Regulation (GDPR), which made the opt-in process a little more difficult and a lot more risky. Related: Read my post on tactics to quickly build your email list as a new blogger. Under the GDPR guidelines, you’re not allowed to automatically add EU residents to your email list without their express consent. This means that when you have a freebie, and someone from EU enters their email address to get access to your freebie, you’re only allowed to send them the freebie itself and any email related to that freebie. You can’t put them in your general email list and start sending them emails later on different topics or marketing offers. I will discuss the details of GDPR in a separate post. If you’re interested in a Facebook Live for me to cover GDPR and its nuances, and do a Q&A, comment below and let me know that you’re interested. Nowadays, email list building is about offering something useful and valuable to your target audience in exchange for their email address. 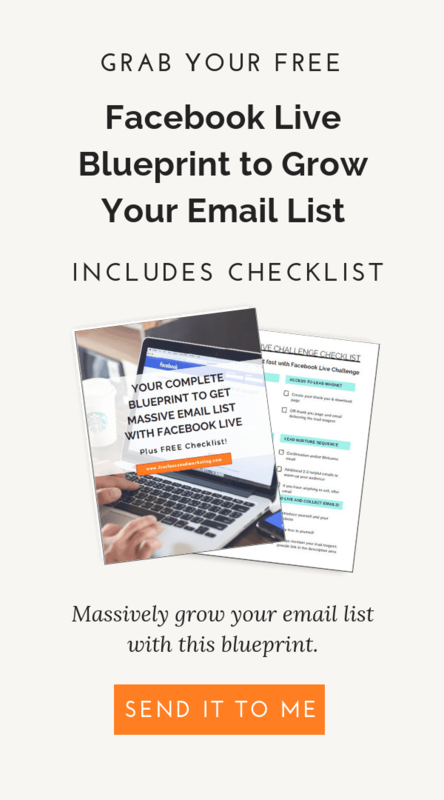 why is an email list essential to making money from your blog? When blogging is not just a hobby for you, you either intend to make money from it in the future or you want to make more money from it. Regardless of your current standing, having an email list is integral to making money from your blog. When you have a healthy email list, you already have a prepped and primed audience for selling to, offering services to, and promoting different products to. Your email list your most valuable property when in your blogging journey. You should never stop building your email list. Always do your best to increase your numbers. However, keep in mind that simply increasing your email list number is not enough. It’s more important to have a list comprised of your target audience, and keep them engaged, than have hundreds of thousands of email list members who are cold and unengaged. This means that you should regularly scrub your list. If you have cold or unengaged subscribers, see if you can win them back with a reengagement campaign. If you can’t, then it’s better to delete these people from your list. Regularly interact with your email list members to be on their minds. So when you do have something to offer from which you will benefit financially, they already know, like and trust you. To build an email list, you need to have a tool for lead generation to collect email addresses, and you need an Email Service Provider (ESP). There are numerous lead generation tools and ESPs out there. I’ve used several different ones, and like some more than others, or like particular sections of different services. ConvertFlow (aff. link)-Lead Generation and overall marketing tool-they have a free tier that you can use. This tool is amazing, and has a lot of features that I yet have to explore. ConvertPro (aff. link)-Lead Generation tool. This is the most customizable tool out there. It integrates well with most ESPs. OptimizeLeads-Lead Generation tool from Optimize Press. I love using their popups. ActiveCampaign (aff. link)-Email Service Provider (ESP). This is my ESP of choice at the moment. I love that I can make deep segmentations with this and literally create any kind of automation I can imagine. ConvertKit (aff. link)-ESP. I still have an active membership with ConvertKit, and think it’s a great ESP. Remember, if you want to profit from your email list, you have to treat it as if it’s important. This means sending your email list members helpful content. Free Download: Communicate easily with your email list members with my Plug & Play Email Templates. Keeping in touch with them, surveying them from time to time to make sure you’re creating content that they want, and are solving their pain points. In later posts I will specifically talk about in detail how to sell to your email list. For now just keep in mind that if you want to monetize, you’ll need an email list that is comprised of your target audience and is engaged. If you’re starting a blog and want to make money from it, then having a content plan would serve you in the long run. What do I mean by content plan? I mean for you to map out exactly what you’re gonna blog about, talk about, when you’re gonna do it, and why you’re gonna do it. Moreover, when creating your content plan, you have to keep your target audience in mind and create content that resonates with them. Your content has to solve their pain points. Also, something that Jeff Walker says stayed with me…Give them what they want, so you can give them what they need later. The way you make sure that you’re giving your audience what they want is to ask them. Do polls, surveys, have phone/video conversations with your target audience. You can also “stalk” their social media pages to see what they’re interested in, what type of content they share and engage in. Lastly, you can also use sites such as Quora and Reddit where you can search for particular questions or topics and see how popular they are, how many people commented on those, etc. Once you do this, your next move should be to determine the format of your content-is it a blog post, a podcast, a video, etc.? Free Download: Get my Top 17 Checklist to write a perfect blog post. Then see if you can take this a step further by creating a helpful lead magnet to go along with this post. Something that complements it. By doing this, you’re helping yourself and your target audience because (1) you’re giving them more resources; and (2) you’re gonna grow your email list when they sign up to get your lead magnet. If you decide to go the blog post route, make sure you pay attention to how you write your post. You want to use language that your target audience uses. You want to sound as if you’re having a conversation with a single member of your target audience. Furthermore, make sure your blog posts are optimized for best performance and traffic. Keep in mind, that starting a blog and making money from it is a gradual process, but it’s not something that will take years to accomplish. 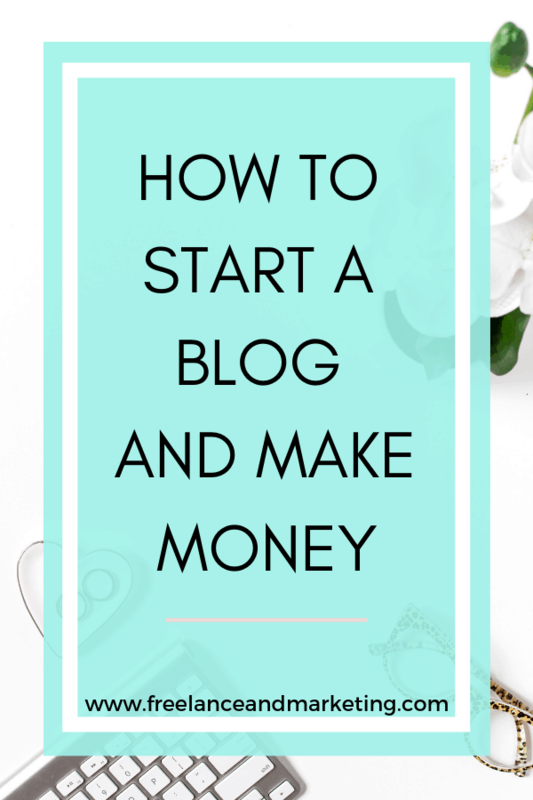 You can start making money from your blog within a matter of weeks if you’re strategic about it. I will go into more details in my later posts on the specific methods to earn money from your blog. If you’re reading this, then I know you’re interested in creating a profitable blog and home business for yourself. This post wasn’t exactly what you’ll call short. This means you’re my perfect target audience. As such, I would appreciate it if you commented below and told me that would you like to see me produce for you that would help you out? Is it a course? A challenge? A workbook? Do you have a specific topic or direction in mind?